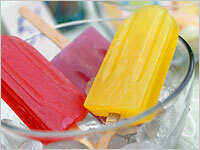 A Month of Popsicle Recipes – KitchenDaily. Okay moms, this is a list of popsicle recipes that you will want to print out and stick on the fridge!!! I bought my silicone popsicle molds on amazon.com. Just be sure to use non-dairy milk & yogurt as a substitute!! « “Crazy, Unbelievably YUMMY”, Vegan Rice Krispy Treats!! !